The catalogue raisonné of paintings by Kay Sage was prepared under the auspices of Hollis Taggart and Mark Kelman. This long overdue publication brings to fruition the meticulous work and scholarship of Stephen Robeson Miller, curator of Double Solitaire – The Surreal Works of Kay Sage and Yves Tanguy in 2011 at the Katonah Museum of Art. It was our objective to produce a complete, authoritative compilation of the paintings of the artist and will include provenance, exhibition history and bibliographic references. The book was released on October 16, 2018. The American Surrealist painter Kay Sage (1898-1963) made dreamlike, architectural structures bathed in a sulfuric light the hallmark of her painted imagery. In so doing, she set her work apart from all other artists championed by Surrealism’s founder, the French poet Andre Breton. In rejecting the biomorphic forms so prevalent in abstract Surrealist imagery, and in particular those characterized by the work of her husband, Yves Tanguy, Sage did much more than carve out a niche in the pantheon of Surrealist imagery: she also created a historical position for her work. Sage was born in Watervliet, New York, just north of Albany, on June 25th, 1898, the second daughter of Henry Manning Sage and the former Anne Wheeler Ward. Both of her parents came from old Yankee families; the Sages, especially, had been well-established in New England since early Colonial times, and had become wealthy in the nineteenth century through the development of redwood timberland in the Pacific Northwest. Her father was president of the Sage Land and Improvement Company, a director of various banking and business enterprises and for ten years New York State Senator. Her mother was unconventional, restless, impulsive and neurotic. As Sage herself later wrote, “My mother was a morphine addict. My father was an upright citizen.” The combination made for an unstable childhood. Around 1900, her parents separated, and her mother began to make trips to Europe regularly, often for months at a time, always taking her two daughters with her. They usually traveled to London, Paris and Lucerne; and stayed in a rented villa every summer on the Italian Riviera at Rapallo. A three month trip to Egypt, made when she was nine years old, left a particularly strong impression, as many of the scenes in her later Surrealist paintings could have been set among the pyramids and monumental ruins beside the Nile River. When her parents divorced in 1908, it was decided that Sage would spent most of each year with her mother and a few months with her father on his upstate New York property. The little girl grew accustomed to two different worlds: her father's, in which everything was formal, genteel and controlled, and her mother’s, which was nomadic, exotic and free. Sage identified with both parents, making her adult personality quite unpredictable. It was during this period that Sage began to lose her way in her pursuit of becoming an artist, for she met and fell in love with an Italian nobleman, Prince Ranieri di San Faustino. Initially, she thought he shared her values, for he could play the piano very well and “could understand my fantastic imaginings and not only tolerate them but feel the same way.” They became engaged and married on March 25, 1925, in Rome. The first few years were happy. Gradually, however, she began to realize her mistake. Her life was dominated by the entertaining expected of a princess in Roman Society; there was no time to paint or even think about it. However, one day in the mid-1930s, while summering in Rapallo on the Italian Riviera, she met by chance the American poet Ezra Pound, who was also living there, and through him an avant-garde German sculptor named Heinz Henghes. Her conversations and friendship with both poet and sculptor inspired her to take up painting again, this time in an abstract geometric manner, a far cry from her conventional landscapes of ten years earlier. The result was that she and Henghes had an exhibition together at the avant-garde Galleria del Milione in Milan in 1936, where he had shown previously and which also showed the work of such modern artists as Giorgio de Chirico, Kurt Seligmann, and Jean (Hans) Arp. The emotional impact of this on Sage was her realization that if she was to ever be an artist, now was the time to break free from her stultifying marriage and follow Henghes’ advice that she move to Paris, the center of the modern art world, and pursue her painting once and for all. Once ensconced in the French capital in the spring of 1937, Sage settled down to paint in ernest, this time in a Surrealist vein. Henghes and other friends who were acquainted with Andre Breton and his Surrealist coterie offered to introduce her to them, but she insisted on postponing any introductions until she had painted enough Surrealist works to have something substantial to show for herself. Finally, in the autumn of 1938 she was ready to exhibit six Surrealist oils at the Salon des Surindependants in Paris. These strong works depicted curious architectonic forms mixed with drapery and mechanical devices and immediately caught the attention of Yves Tanguy, who had gone to the exhibition at Henghes’ urging. Tanguy in turn brought Breton to see them. 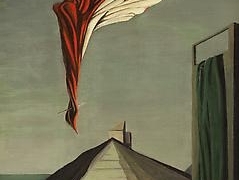 “Kay Sage, man or woman, I didn’t know,” Tanguy later recalled; but because of the paintings’ strength, Breton decided that Kay Sage was a man’s name. Later, Henghes finessed an introduction between Sage, Tanguy and Breton, and no time was lost in bringing her into the Surrealist group. But Sage’s connection to Tanguy did not end there. Within a few months, she fell in love not only with his paintings, but with him. The love letters that she wrote him during 1939 are testimony not only to their developing relationship but provide a fascinating glimpse into the comings and goings of the Surrealist group just before the outbreak of World War II. In October 1939, Sage set sail from New York, but not before having made arrangements for Tanguy to follow her to safety. In her efforts to save him and help the other Surrealists, she started The Society for the Preservation of European Culture, enlisting the help of the American Ambassador and the French Minister of Education. Under the auspices of the Society, a series of exhibitions were planned in New York of the work of contemporary French artists, the proceeds from which would be used to help children involved in the war conflict. Tanguy was to inaugurate the series with a solo exhibition at the Pierre Matisse Gallery beginning in December; he joined her in New York in November. Many of the other Surrealists eventually arrived in New York over the next year. Pierre Matisse also provided Sage with an inaugural exhibition in June, 1940. On a trip to the western United States, Sage and Tanguy married in Reno, Nevada, on August 17th, 1940. Later, visiting their friend Alexander Calder in Roxbury, Connecticut, they became familiar with countryside that permitted easy access to New York. As a result, in 1941, they left Greenwich Village and moved to Woodbury, Connecticut. The community included, besides Calder, such artists and writers as Peter Blume, Andre Masson, Hans Richer, David Hare, Arshile Gorky, Naum Gabo, Marc Chagall, Matthew Josephson, and Julien Levy. It was there that the couple lived for the rest of their lives. Sage’s years with Tanguy in Connecticut were to be her happiest and most productive. The art of Kay Sage belongs to a descriptive form of Surrealism, an art in which the scene is unreal, but the setting and the individual objects in it are painted with fidelity. Nevertheless, it is not easy to say what, exactly, the subjects of Sage’s paintings are; one can really only say what her subjects resemble. Her paintings depict deserted expanses of sand or water painted in muted greens, grays and ochre. There are clear skies and bleak horizons. These desolate landscapes are populated by angular forms that suggest architectural scaffolding. Composed of piers, ladders, ribs, rigging, frames and lattice, they are skeletal structures, intricate and fragile. Delicately balanced towers appear unfinished, whether in process of being constructed, or in process of being destroyed, it is impossible to say for certain. Often, they are enlivened with flags and bits of torn drapery, the softness of the cloth contrasting with the constructions’ angularity. All is bathed in a bleaching, sulfurous light. Stillness and silence prevails. One can repeatedly return to Kay Sage’s paintings and never grow tired of contemplating their mystery and poetic intensity.